The controversial giant statue depicting Alexander the Great was officially opened Tuesday in Macedonia's capital Skopje. 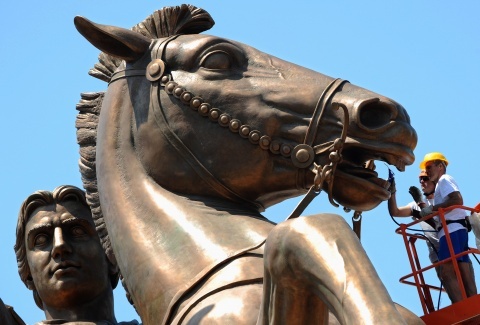 The 13-meter high statue of a warrior on horseback resembling Alexander the Great in downtown Skopje, which was finished over the weekend, has enraged Greece, which also claims inheritance of the historical figure. Macedonia is already at loggerheads with Athens over its name. Greece opposes the post-1991 constitutional name of its northern neighbor, citing historical and territorial concerns resulting from the ambiguity between it and the adjacent Greek region of Macedonia. The newly erected Alexander the Great statue is a part of recently reelected Prime Minister Nikola Gruevski's ambition of "Skopje 2014", his multi million plan for a radical reinvention of the city center, which focuses on the nation's "ancient" history.